A few months ago I came up with a great idea for a toddler gift. I just needed to find the right person to give it to. 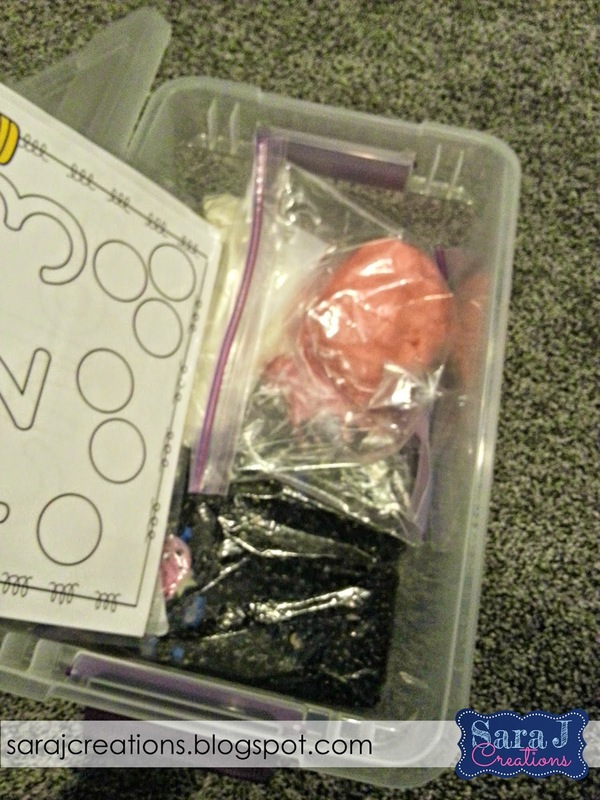 My vision was a sensory bin that had different sensory activities in it, each in its own bag, that could be dumped out in the bin, played with and put away with minimal mess. 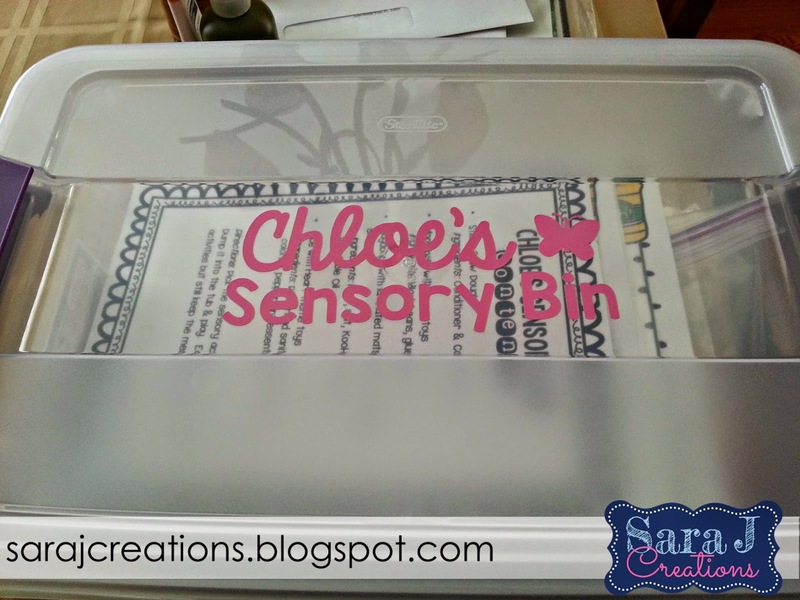 The idea came from the fact that my daughter loves sensory bin activities so I'm sure other toddlers would too. They are often easy to make but require time and supplies and often make a mess which is why I think other parents might avoid making them for their child. I needed to wait to give this gift to the right person because I know that even with the bin to play in, messes happen and I need to give it to a child who has parents that wouldn't mind the mess. I finally had the chance to put my plan into action when we were invited to one of K's friend's 3rd birthday. Her mom is a former high school teacher and is very into crafts/projects and tolerant of messes so I figured this would be the perfect chance to try it out. Her party was the day after we got home from Florida so I didn't know if we'd make it to the party (turns out we didn't because K got sick) but I prepped the bin before we left. A lot of the items were things I had on hand or could easily find at the dollar store. I also made some playdough mats to go with it. I made one with the little girl's name on it, one that practiced shapes and one for numbers 1-3. I laminated the mats and we were good to go. This was based off of THIS recipe. I used black beans, glue, water and glitter. Mix them altogether and spread them out on a baking sheet covered with wax paper. 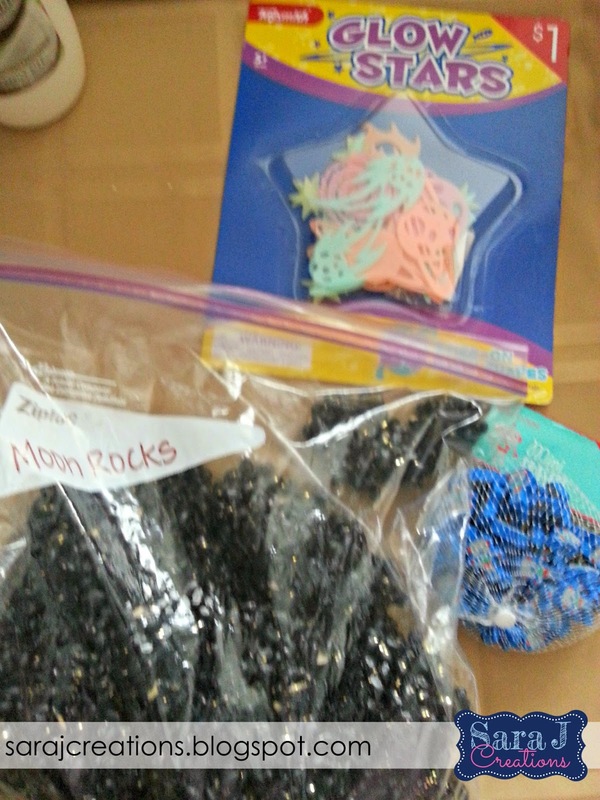 Let them dry and then break apart the moon rocks. I added space themed toys - glow in the dark planets and little robot erasers from the Dollar Spot at Target. I decided to go with a Valentine's themed rice bin since the party was the beginning of February. I tried a new technique to get a vibrant pink color. I used a few squirts of hand sanitizer and gel food coloring. The color came out as a really bright magenta and I loved it. It dried really quickly. I think this might be my new go to technique for dying rice. I put a few drops of peppermint essential oil in to make it smell yummy. 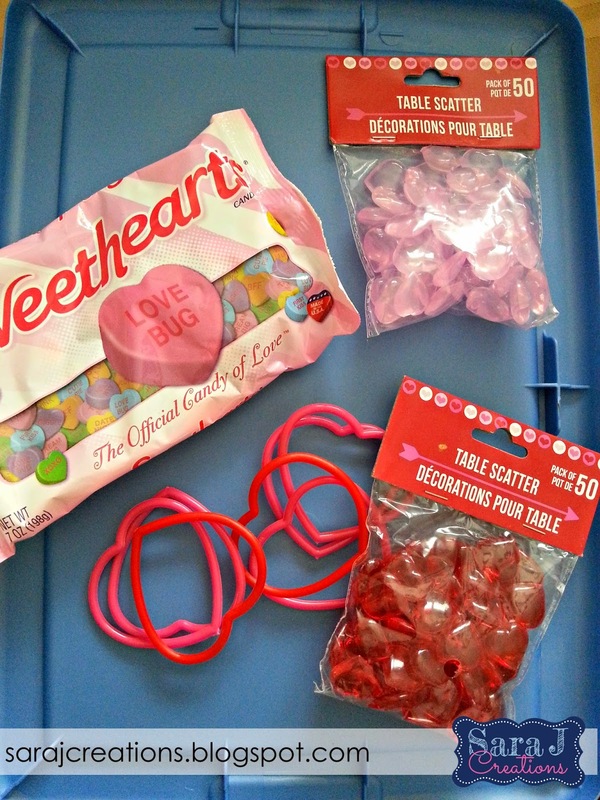 I added some hearts that I found at the dollar store. I blogged about snow dough HERE. I whipped up a batch for this project. Just a note, while this is super easy and only requires 2 ingredients, it is a different consistency than playdough. It makes a bit more of a mess than normal playdough does so don't be tricked by the way that it looks. Also, the directions said the cheaper the conditioner, the better. I'm going to suggest you smell the conditioner first and make sure you can tolerate the smell. The scent of the batch I made for K drives me nuts and I can smell it even when it is in the glass bowl with the lid on it. So make sure it is cheap (and white) but smells okay. I typed up a direction sheet. 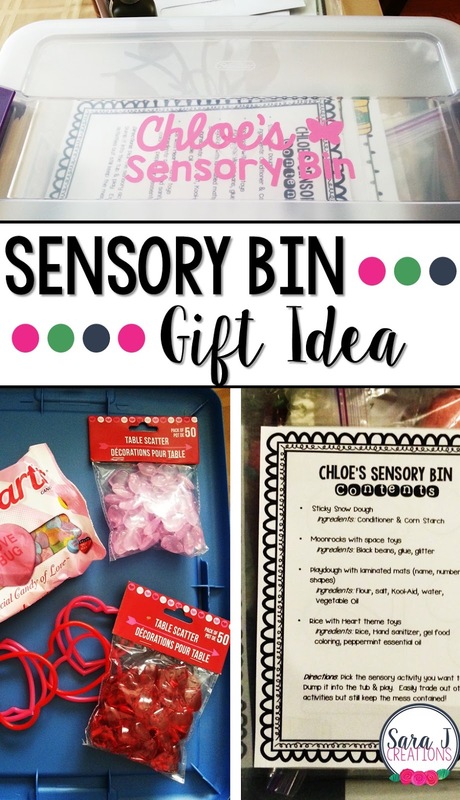 I think the activities are self explanatory but I gave an overview of how you can use each type of sensory activity in the same bin. I also included the ingredients in case of allergies or if they wanted to replicate anything I made. I bought a plastic bin with a lid that closes with clips on the side (similar one HERE). Then I used my Silhouette Cameo to cut out letters out of vinyl to stick to the top. Ribbon tied around it and boom - done!! While it definitely took time to collect the supplies and make the different mixtures, it really was a pretty quick and easy gift. 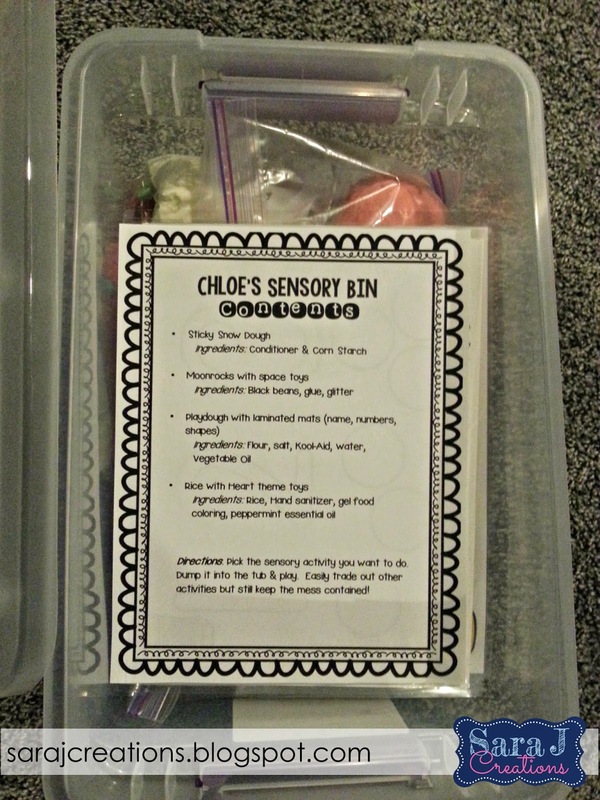 There are so many different sensory ideas out there that you could use for a gift like this. I only did ones that we had tried and loved at our house. You could easily adjust this for a boy or girl and make it specific to their particular interests at the time. 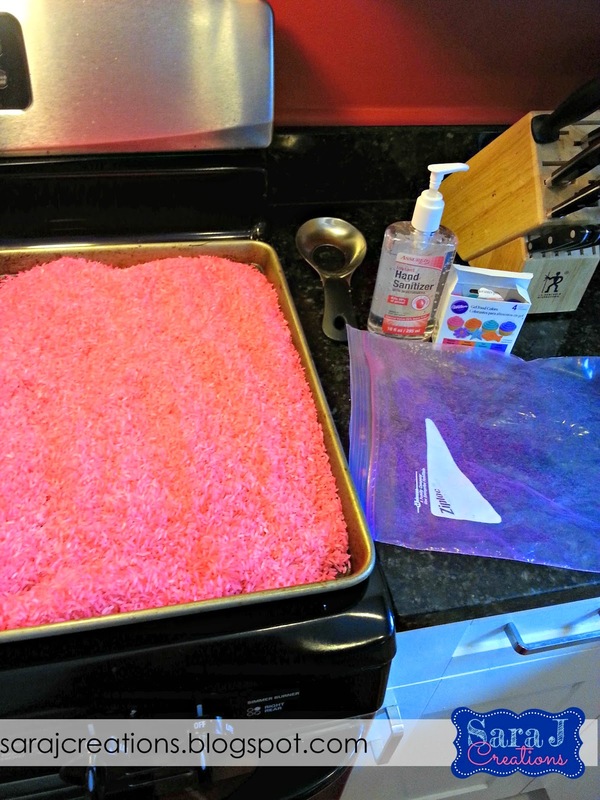 The possibilities are endless and I'm already planning for the next time I can make a sensory bin for someone else. Affiliate links provided for your shopping convenience.